Papaya, a fruit that contains not only high amount of antioxidant, but also an enzyme (papain) which helps digest protein. Snow fungus, nourishes your lungs and skin. Black-eyed beans as a kind of legumes. I did not need to highlight the rest of the familiar ingredients. 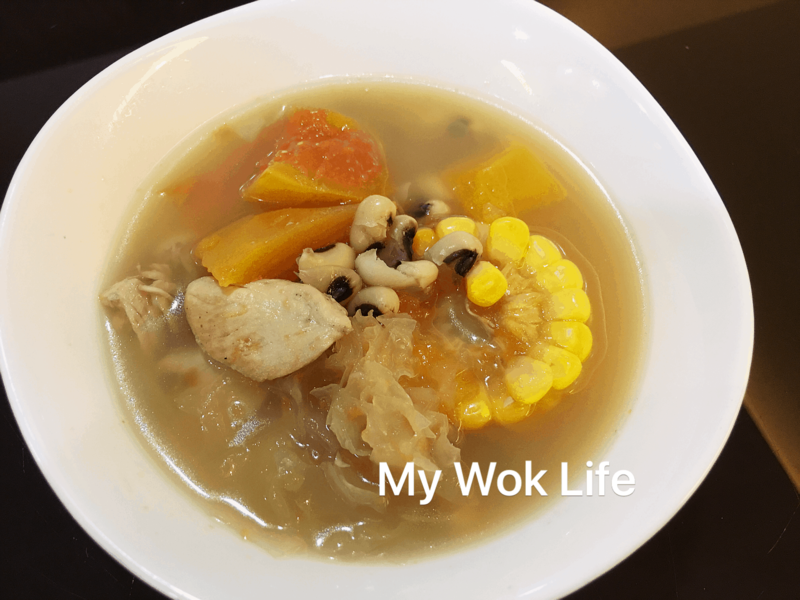 Best thing, this super delicious soup was so flavourful with its natural sweetness from the papaya, we don’t need much of the seasoning here. A pinch of salt would be the limit to it. 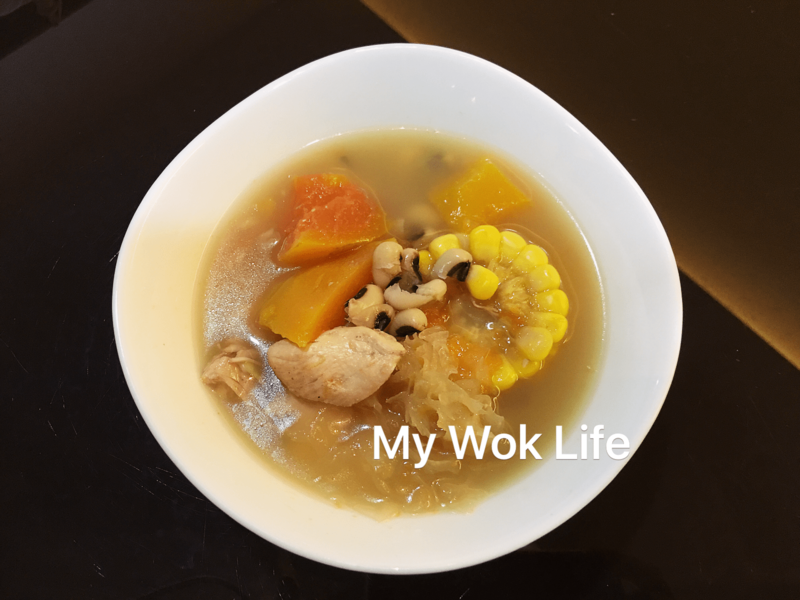 Drink this soup and eat the ingredients on its own, or add some bee hoon to the soup, or simply compliment it with a plate of brown rice. It’s so much more fulfilling and healthy. Trust me, this is a super tasty and light soup dish. And, it’s great to feed the soup to your young ones, too. (1) Heat (non-stick) pot with cooking oil over medium high fire. Season chicken with light soy and pepper and add to the pot to sauté till lightly browned on both sides. (2) Add black-eyed beans, snow fungus, corn, and papaya, followed by water. It might create some sizzling effect once water poured in. (3) Let it bring to a boil before lower the heat to simmer for 40 minutes. Add salt before heat off. Serve hot. 1 serving of my papaya soup with chicken breast counts less than 200kcal. Note: Suitable for children 8-month old onwards, do not add salt to the soup. It’s sweet and tasty in its natural way! Tips: Peel or leave the papaya skin. With peeled papaya, it tends to disintegrate more easily if stirred too vigorously. If leave it unpeeled, make sure the skin is scrubbed and washed thoroughly. * Unless you are using the fresh/ pre-soaked snow fungus, one large bulb of dried snow fungus will be more than enough even if you loved it so much as it will expand once soaked in water. * If chicken breast is not your favorite, use skinless drumsticks or thighs. * It is not necessary to season the chicken meat for extended time in this recipe. Probably 5-10 minutes, if desired. * Black-eyed beans are available in the dried goods sector of major supermarkets.